Boyslikeme present NEXT FALL, by Geoffrey Nauffts, in the Reginald Theatre, at the Seymour Centre, Chippendale, 26th October to 19th November. NEXT FALL, by Geoffrey Nauffts, is a play with gay themes concerning an Odd Couple: a closeted Christian man, Luke (Alex Ewan) living in partnership with an atheist, Adam (Darrin Redgate) and all the conundrums socially, politically, emotionally that that 'arrangement' might throw up. Especially, when Luke in a coma in hospital after an accident, results in his 'blood' family and his 'tribal' family to meeting up for the first time. I saw NEXT FALL in production on Broadway, in New York, in 2010 and found it a fairly lightweight sit-com. The Direction had the performers highlight the cliche of the character 'types' and played to its audience for the laughs (of which there were many) and the syrupy sentimentalisms of the situation (of which there were many, as well.) I was irritated with the 'glitzy' comic/sentimental manipulations of it all and, in a 'snobbish' way, aghast at the American audience buying into it with such alacrity. 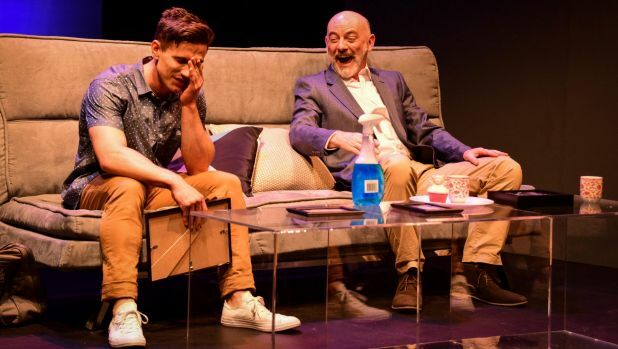 I had seen an off-Broadway production of THE TEMPERAMENTALS, by John Marans, at the New World Stages and had found in this work a gay-themed production of tremendous integrity and inspiration, that I wished the audiences attending NEXT FALL were getting. The contrast of method of aspiration was significant. The difference in inspiration, too, was significant. I was invited by the producers of this production at the Seymour Centre to go see. I was reluctant. So, it is interesting to report that despite the modest production values (in contrast to the Broadway effort), I found NEXT FALL, as an experience, a little more palatable. My 'date' for the performance was very moved and pleased to have seen it. The company of actors, Victoria Greiner (Holly), Mark James Dessaix (Brandon), Mary-Anne Halpin (Arlene), Cormac Costelllo (Butch), and the aforementioned, Mr Redgate and Ewan, under the Direction of Andy Leonard, playing in the intimate space at the Reginald Theatre, have created characters, that though still cliche in the writer's conception, have been fleshed out more 'naturalistically' and convey a simple honesty and vulnerability with the human and political 'issues' front-and-centre rather than 'hammering' the comedy/sentiment of the writing. I, particularly, was impressed with the performance of Mr Ewan as the Gay Christian, giving Luke a naivety to the position he had taken in being able to ignore the full ethical dilemmas of his beliefs, using a charm offensive to over ride too deep an interrogation of them from everybody. Too, the small scale honesty, fragility, of Ms Halpin, as Luke's mother, was tremendously moving. This production of NEXT FALL is a light entertainment Directed and played with a simple and heart warming integrity. It finishes this Saturday.